We are ready to help you planning and organize a party to remember. Our Parties are filled with 1 hour of fitness fun that can’t be matched. Our gym coach will entertain your little bundles of energy with warm-up activities, rotations through our gym equipment and obstacle circuit. Younger children will have a blast on our pint-size equipment, just right for little bodies with big energy. Our full-size equipment is perfect to challenge the older kids, to gain strength, build confidence, and have a really great time. It’s pure birthday fun! At the end of the first hour, the coach will lead the kids to the party area. That’s when you take over and run your own party for 45 minutes. If your party gets done early the coach will still be around to let them play a little more. $250 for up to 12 kids; $12 for each additional child. The birthday child is free – our treat! Adults and non-party participants are not allowed on gym equipment. REQUIRED!! A filled out and signed Gymnastics World Release Form must be turned in for all participants. Download a form and bring with you, or fill one out on-site. During our Rhythmic Party, your guests will participate in 1 hour of games and activities introducing them to the beauty and grace of rhythmic gymnastics. 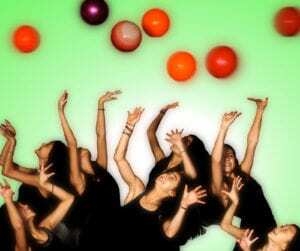 They will have the opportunity to play with rhythmic balls, hoops, ribbons, and ropes. The party will be based on games using rhythmic equipment, circuits where they will learn dance moves, tosses and, ribbon manipulation. Participants will have a chance to try jumps and other acrobatic skills on floor and tumble track. It’s unforgettable Rhythmic fun! At the end of the first hour, the coach will lead the kids to the party area. That’s when you take over and run your own party for 45 minutes. If your party gets done early the coach will still be around to let them play a little more. Ninja Birthday Parties are fun, safe, and guaranteed to tire children out! A great option for birthday celebrations or just a fun time with friends. We set up courses for time and speed, allowing all participants to test strength and compete with one another in an enjoyable and safe space. Children will also try a combination of flips, rolls, jumps, and kicks. It’s pure Ninja fun! At the end of the first hour, the coach will lead the kids to the party area. That’s when you take over and run your own party for 45 minutes. If your party gets done early the coach will still be around to let them play a little more. Our gymnastics parties are filled with 1 hour of gymnastics activities that can’t be matched. Our gym coach will entertain your little bundles of energy with warm-up activities, rotations through our gymnastics equipment and obstacle circuit. Younger children will have a blast on our pint-size equipment, just right for little bodies with big energy. 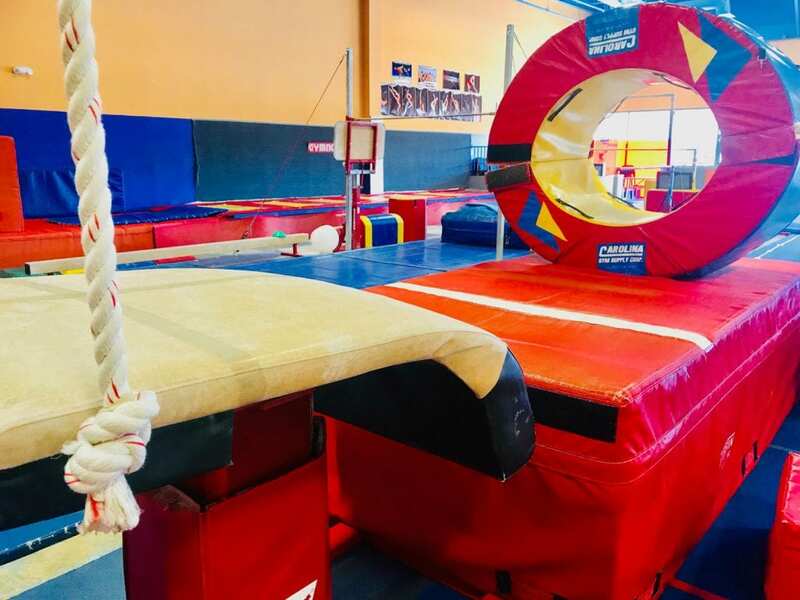 Our full-size equipment (rings, rope, bars, tumble track and more are perfect to challenge the older kids, to gain strength, build confidence, and have a really great time. It’s pure birthday fun! At the end of the first hour, the coach will lead the kids to the party area. That’s when you take over and run your own party for 45 minutes. If your party gets done early the coach will still be around to let them play a little more.